A trademark is a word, phrase, logo, or symbol that identifies and distinguishes a product or service from others in the marketplace. All the products and logos of Santec has a registered trademarks denoted by (SANTECTM). This trademark may not be used in any manner without prior written consent from Santec India. Using the company's name, logo or other trademark protected materials in a manner that may mislead or confuse others or be used for financial gain may be considered trademark infringement. 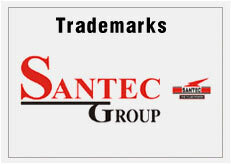 With a registered Trademark, Santec is completely protected from any kind of brand infringement. This intellectual property of the company serves to fulfill the public policy objective of consumer protection, by preventing the customers from being misled as to the origin or quality of a product or services.